So if you are reading this I assume you are plagued by OS X’s inability to cope with having more than one copy of the same font installed. I was quite worried when I first saw this but actually it is a very minor problem in terms of fixability. I had been installing a lot of custom fonts earlier in the day so it wasn’t difficult to put 2 and 2 together as to what was causing it. 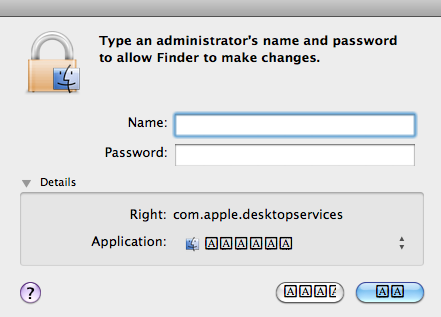 First… Macs make a fuss if you install multiple versions of the same font. 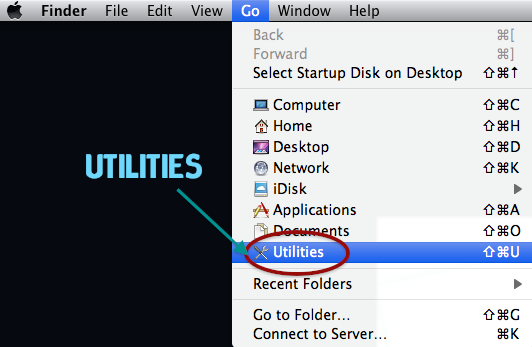 Second… The default Mac font is Lucida Grande, so this is generally the culprit for the vast majority of issues. So with this knowledge in hand let us continue. Surprisingly, you don’t actually have to delete or uninstall anything (or at least I didn’t) to solve this problem. You do have to ensure that you resolve the conflicting fonts though to ensure that the problem doesn’t keep reoccurring. But don’t worry, my solution is pretty simple. 2.) Make sure you have selected the All Fonts list, then go down the font list until you come to a font that has an issue – any font with a clash will have a yellow triangle next to it. 3.) 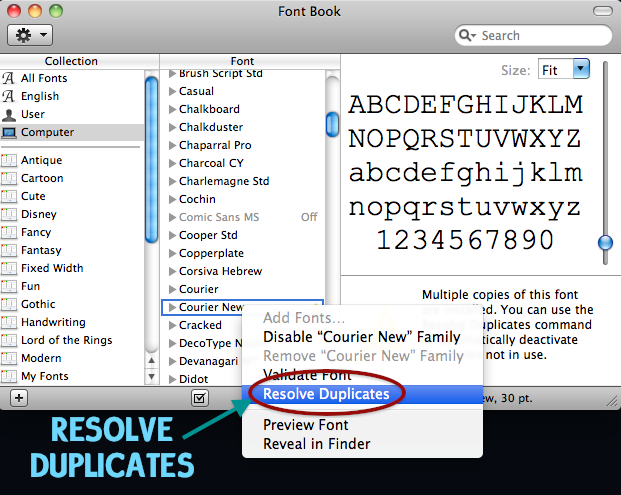 Right click on the font and from the drop down menu choose Resolve Duplicates. 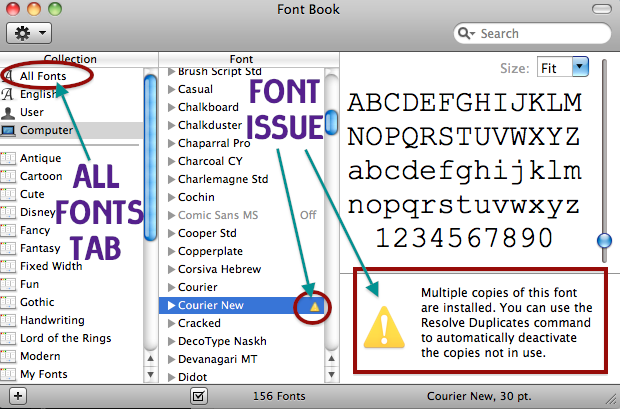 If the issue is successfully fixed the multiple versions of the font will be turned off. NOTE: You need to be an Administrator in order to use a sudo command so change users if you are not currently logged in as one. 3.) You will be asked for your admin password. Type it in. The cursor will not move as you type so be careful. 4.) 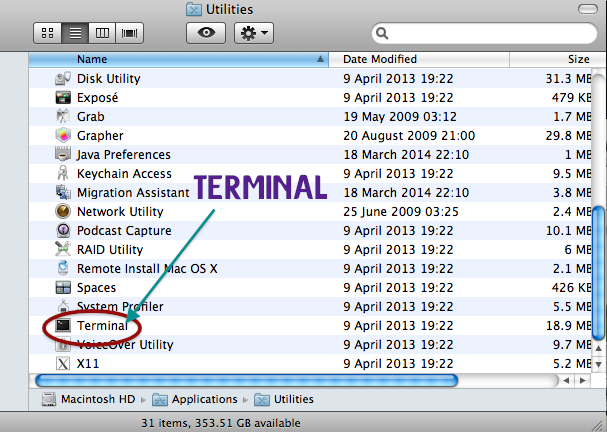 Once the command has run (you will see several lines of script) close Terminal and restart your computer. It is important that you do this straight away. 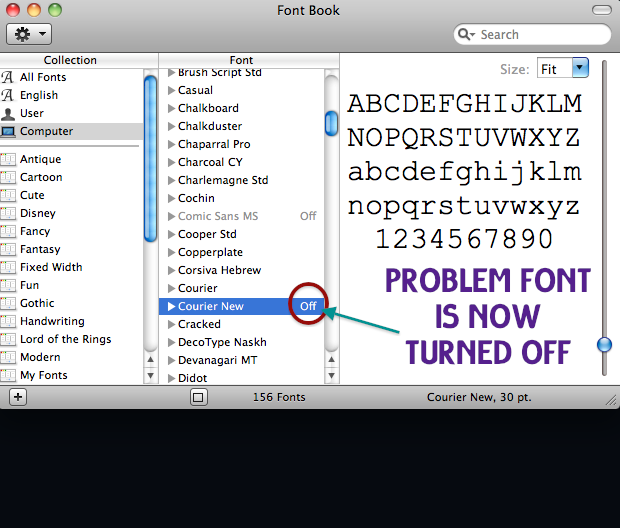 Hopefully you will now find your OS X all happy and font issue free! Hooray! There are many helpful posts about this on the WordPress Support. But trawling through scores of posts to find a specifically relevant AND detailed one can be a bit of a nightmare. So I thought I’d write a post on it myself. Most themes in WordPress.com have an inbuilt font. This means that however much you change the colour and things they often revert to the default theme. With other things you don’t have the options available in the default WordPress.com Edit Post screen. But you can override all this by using HTML. In order to change your text style, size etc. you need to use HTML tags. A lot of posts tell you this. And then don’t tell you how to switch to the HTML side of things. Yay, helpful! In order to use HTML you have to click the right hand tab labelled Text on the Edit Post page. So, to completely avoid all and any misunderstandings or confusion, I will write down all the details. If you know the tabs I mean just skip this. then go to the post you want to edit and click Edit. You should now be on the Edit Post page. Now onwards to the actual editing! If you want to change your text font style and you are handy with font names then you don’t need to use these resources. If you are not sure of the names of the fonts you want there are some handy resources at Wavian.com It’s a page with links and a decent font list with a good variety of styles. There’s also a page discussing the standard web safe fonts here. I personally don’t pay that much attention to whether they are standard or not as this blog is purely for my own amusement, but it depends what you need. which is an amazing quote from the immortal Sherlock Holmes. When you use HTML tags to change the font in WordPress.com you always need to remember to create an open tag and a close tag. So you always open with (span)* and close with (/span)*. In HTML every colour has its own code. For example, Black is #000000, White is #FFFFFF, Red is #FF0000, Blue is #0000FF, and so on. There is a great resource called HTML Color Picker which you can use to find the HTML colour code you want. So, things to remember about HTML tags. 1.) Always remember to open with and close with (span) and (/span)*. 2.) Always remember to create a close tag. 3.) Check your spelling! Misspelled tags won’t work. each separate part (style/size/colour) is separated with a semicolon ;. 5.) Remember, not all font styles and colours will work. Trial and error is the best way to find out what works for you. OK, that’s all from me. Have fun HTML-ing. Hope it goes well.